Nowadays more and more physical places all over the world have started accepting Bitcoins as a payment. 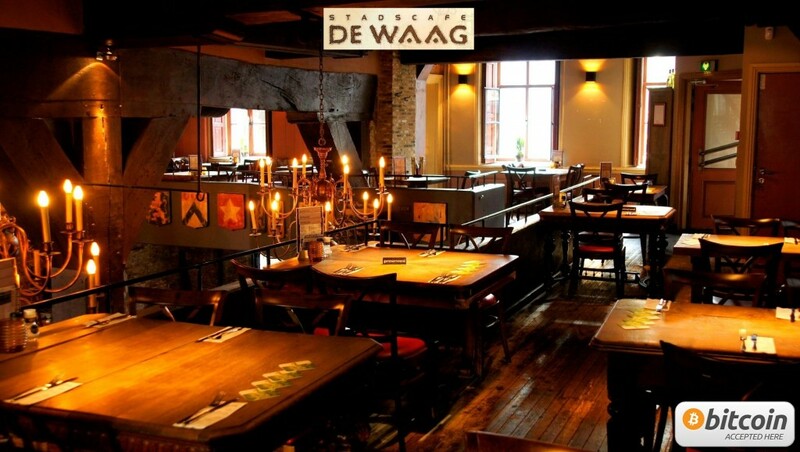 But in the Netherlands restaurant ‘De Waag’ in Delft is the place where it all began. They are still seen as the number one in NL which made it possible to pay your coffee, beers and à la carte meals with Bitcoins. We took an interview with Hugo Overvoorde, manager of De Waag, to ask him about the beginning of times, the development of Bitcoin in De Waag and about the present situation. Christien Havranek: When did you start with accepting Bitcoins in De Waag and what has been the reason of that? Hugo Overvoorde: In the second half of April 2013 we started with accepting Bitcoins as valid currency. The main reason for that was the suggestion of Ronald Prins (one of the founders of Fox-IT, a Dutch security company who prevents, solves and mitigates cyber threats for government, defense, banking etc worldwidehttps://www.fox-it.com/en/) who approached me [and said] that it would be great to be the first in the Netherlands where it is possible to pay with Bitcoins. He was already into the Bitcoin for a couple of years and knows a lot about them. And while Delft is maybe the most innovative city of the Netherlands because of the TU Delft, Delft University of Technology (http://www.tudelft.nl/en/) it seemed to be a good idea. I did not know anything about Bitcoins, but I saw it as a change I should take. So I started reading and reading and after two days I knew enough about them to confirm. Together with Ronald Prins we started this up and that made De Waag being the first physical place in the Netherlands where it is possible to pay with Bitcoins. CH: So that was the first step and the beginning. And then what happened after this decision? HO: About two weeks later the whole Dutch media approached me for interviews. Newspapers, radio channels and also television programs called me, it was very busy on that way. It seemed to be that Bitcoin has officially born in the Netherlands. They even made a short sketch about how to pay with Bitcoins in de Waag. Also to show others how it works. It seems a bit to be a success story because this craziness is still going on now. CH: What are the consequences for De Waag itself because of Bitcoin? Do you see changes in sale or audience? HO: I don’t see a lot of difference in the sales yet. I don’t care about this because I rather regard it as an extra service we deliver to our customers. What I see, is the changing and the growth of the guests who pay with Bitcoins. In the beginning it were especially the ‘ICT guys’ who came in with the story that they bought some Bitcoins in 2009 for a few dollars and asked me if it is true, that they can pay their beers now with them. They were positively surprised. The population who have Bitcoins now is expanding. What I see around me is that not everybody who has them pays with them a lot. While it’s a bit of a rebellious monetary unit it seems to be cool having them, so they keep them. The raising offer of places where you can pay with them creates more news and this increases the interest of people for Bitcoins. Don’t think that we have hundreds of transactions with Bitcoins now. Normally it is between five and ten a week. We like to see the same people come back. For example a group of around five people who pays with Bitcoins is visiting de Waag for dinner every week now. Generally it’s going about transactions between 30 and 40 euro’s. The last week we just had one or two Bitcoin transactions. This is because of the enormous raise of the value last time. The Bitcoin increased from 97 to over 300 euros in about two weeks. Who could imagine this would happen so fast? Everybody seems to really take care with spending them now and keep them into the pocket because it can be that they raise a lot more. CH: Do you see it as a risk, using the Bitcoin as currency at De Waag? HO: Of course you don’t know what is going to happen with the Bitcoin. From the first day on some people laughed about us accepting Bitcoins because they think that it’s just temporarily and it will fall down very soon. But it’s still here, and when this ever would happen, it was a very good step to be the first restaurant in the Netherlands. This also because of all the publicity. Next to the radio and television in the Netherlands also abroad the press approach us for interviews. When you translate this free publicity into money it’s a big win anyhow. And next to this, a great adventure we really wouldn’t have missed. CH: What do you do with the Bitcoins De Waag receives? HO: What we do with a Bitcoin transfer is generate the euros into Bitcoin with an iPad, and then people can pay by using the QR-code. Than we put it on a kind of Bitcoin Bank, www.bitmymoney.com. Ronald de Reinder, owner of this bank, sends us an email every week with the question how much of the received Bitcoins we do want to receive as cash. Every week we cash some. But we also leave Bitcoins on it, especially at times like this when the rate is rising so enormously. CH: What do you expect for the future of De Waag and the Bitcoin? HO: The only danger I can imagine now is that wallets might be hacked. I don’t expect the Bitcoin to fall down and so we will go on with this for sure. We like it to be a quick and transparent way of paying. It’s interesting that some important parties are approaching us now like the Dutch tax authorities, they don’t know what to do with Bitcoins and taxes. Last week I also had a conference call with the Dutch Bank. They need to do something with the Bitcoin, so they are also looking for a way to maintain this currency. This also means that the acknowledgement about Bitcoin is still raising and proves our statement to accept Bitcoins in De Waag till the end of time. Christien Havranek has a background in Social Psychology and (Marketing) Communication. She works as a freelancer and became interested into Bitcoin due to a friend of hers building hardware. She is living in Delft, the innovation city of technology in the Netherlands, and wants to spread Bitcoin by making it doable for everybody. Other jobs she does are helping companies with their Facebook communication, building stages, decorations and entertainment (on festivals, parties). Being half Austrian, in winter she teaches ski and snowboard and loves the mountains. Hobby’s: running, travelling, photographing and playing the drums on stages all over Europe with her band. If you have any questions, don’t hesitate to contact her at [email protected].